"US-2" redirects here. For the Japanese US-2 flying boat, see ShinMaywa US-2. U.S. Route 2 or U.S. Highway 2 (US 2) is an east–west U.S. Highway spanning 2,571 miles (4,138 km) across the northern continental United States. US 2 consists of two segments connected by various roadways in southern Canada. Unlike some routes, which are disconnected into segments because of encroaching Interstate Highways, the two portions of US 2 were designed to be separate in the original 1926 highway plan. The western segment of US 2 has its western terminus at an interchange with Interstate 5 (I-5) and State Route 529 (Maple Street) in Everett, Washington, and its eastern terminus at I-75 in St. Ignace, Michigan. The eastern segment of US 2 has its western terminus at US 11 in Rouses Point, New York and its eastern terminus at I-95 in Houlton, Maine. As its number indicates, it is the northernmost east–west U.S. Route in the country. It is the lowest primary-numbered east–west U.S. Route, whose numbers otherwise end in zero, and was so numbered to avoid a US 0. Sections of US 2 in New England were once New England Route 15, part of the New England road marking system. The western segment of US 2 extends from the Upper Peninsula of Michigan across the northern tier of the lower 48 states. Most of the western route was built roughly paralleling the Great Northern Railway. US 2 adopted the railway's route nickname "The Highline" as the most northern crossing in the U.S. The Adventure Cycling Association's Northern Tier Bicycle Route is a bicycle touring route which follows or parallels US 2 for over 600 miles (970 km), most notably a 550-mile (890 km) stretch between Columbia Falls, Montana and Williston, North Dakota. Within Washington state, US 2 is the northernmost all-season highway through the Cascade Mountains. It begins at Interstate 5 and State Route 529 in Everett, and travels east via Stevens Pass. It intersects US 97 approximately 4 miles (6 km) east of Leavenworth and continues as a duplicate route crossing the Columbia River at Wenatchee, then continues north as far as Orondo, where US 97 splits north. US 2 continues to Spokane and the border in Newport. Shortly after entering Idaho from the west, US 2 crosses the Priest River. US 2 follows Pend Oreille River to its source at Lake Pend Oreille. US 2 intersects Idaho State Highway 57 in the town of Priest River at mile 5.8. US 2 intersects US 95 at mile 28.4 in the town of Sandpoint. The two routes are duplexed for 36.2 miles (58.3 km) until just after Bonners Ferry. At Three Mile Corner, US Route 2 continues southeast for 15.8 miles (25.4 km) where it crosses into Montana. US 2 is a vital northern corridor for Montana and has more mileage within Montana than in any other state. 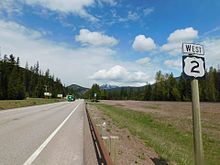 It intersects US 93 at Kalispell and passes through the southern end of Glacier National Park, crossing the continental divide at Marias Pass, before it enters the Great Plains west of Browning. It travels through Shelby where it meets Interstate 15, before it goes on to Havre. The highway continues east and leaves the state near the confluence of the Missouri and Yellowstone Rivers. US 2 is an east–west highway that runs through North Dakota’s northern tier of larger cities: Williston, Minot, Devils Lake, and Grand Forks. US 2 intersects US 85 at Williston, US 52 and US 83 at Minot, US 281 at Churchs Ferry (west of Devils Lake), and the I-29 / US 81 concurrency at Grand Forks. US 2 is four-laned from North Dakota’s eastern edge to just past Williston, a stretch of about 343 miles (552 km), leaving the remaining 12 miles (19 km) to the Montana border as a two-lane highway. In Rugby, just east of the route's intersection with ND 3, the highway passes the location designated in 1931 as the geographical center of North America. The monument marking the geographic center had to be relocated in 1971 when US 2 was converted from two lanes to four lanes. The portion of US 2 from Cass Lake to Bemidji is officially designated the Paul Bunyan Expressway. It also intersects US 169 and the Mississippi River in Grand Rapids, Minnesota. At the crossing between Duluth, Minn. and Superior, Wisc., the highway crosses the Richard I. Bong Memorial Bridge, about 8,300 feet (2,500 m) in length—roughly 11,800 feet (3,600 m) in length when the above land approaches are included. Of the 266 miles (428 km) of US 2 in Minnesota, 146 miles (235 km) have four lanes, mostly located in the northwest part of the state. Legally, the Minnesota section of US 2 is defined as Routes 8 and 203 in Minnesota Statutes §§161.114(2) and 161.115(134). After crossing the Bong Bridge and entering into the city of Superior, Wisconsin's western segment of the highway joins Belknap Street. After crossing the midsection of Superior, US 2 merges with US 53 for a few miles following East 2nd Street out of the city. Ten miles outside of Superior, US 53 and US 2 part ways. US 53 veers south toward Eau Claire, while US 2 continues to the city of Ashland and ultimately to the Wisconsin–Michigan state line at the city of Ironwood. An eastern segment of US 2 re-enters Wisconsin 4 miles (6 km) northwest of Florence and proceeds concurrently with US 141 for 14.5 miles (23.3 km) until exiting Wisconsin again near Iron Mountain, Michigan. US 2 enters Michigan at the city of Ironwood and runs east to the town of Crystal Falls, where it turns south and re-enters Wisconsin northwest of Florence. It re-enters Michigan north of Iron Mountain and continues through the Upper Peninsula of Michigan to the cities of Escanaba, Manistique, and St. Ignace. Along the way, it cuts through the Ottawa and Hiawatha National Forests and follows the northern shore of Lake Michigan. It ends at I-75, just north of the Mackinac Bridge in St. Ignace. The west terminus of the east section in eastern New York. The eastern segment of US 2 traverses the northeastern part of New York and the northern New England states. The road starts at US 11, just 1 mile (1.6 km) south of the Canadian border at Rouses Point in Champlain, New York. From there it crosses the Richelieu River at the outlet of Lake Champlain on the Rouses Point Bridge into Grand Isle County, Vermont. US 2 traverses the length of Grand Isle County and crossing Lake Champlain over several bridges until it reaches the mainland in Milton and Chittenden County. From there it travels south to Burlington, where it begins to closely parallel Interstate 89 all the way to Montpelier and Washington County. At Montpelier, the road turns north-eastward, crossing into Caledonia County and passing through Saint Johnsbury. It then passes into Essex County, and eventually crosses the Connecticut River from Guildhall, Vermont into Lancaster, New Hampshire. Once into New Hampshire, the road continues southeastward, passing through Jefferson (home to several small amusement parks and roadside attractions, such as Santa's Village and Six Gun City) before heading more easterly, skirting the northern edge of the White Mountain National Forest into Gorham, where it meets Route 16, the major north–south roadway through the eastern half of the forest and past Mount Washington. From Gorham, the road travels east along the southern banks of the Androscoggin River to Shelburne and eventually crossing into Gilead, Maine. Throughout its entire 35-mile (56 km) stretch, the New Hampshire portion of US 2 is exclusively in Coos County. US 2 travels from Gilead to Houlton near the Houlton International Airport. US 2 ends just west of the Canadian border at the termini of I-95 and Route 95. A large portion of the western segment of US 2, and a shorter piece of the eastern segment, follows the old Theodore Roosevelt International Highway. This auto trail, named in honor of the late former president and naturalist Theodore Roosevelt, was organized in February 1919 to connect Portland, Maine with Portland, Oregon. The route taken by this highway left Portland, Maine to the northwest, crossing New England via Littleton and Montpelier to Burlington. It crossed Lake Champlain on the Burlington-Port Kent Ferry and headed west across upstate New York, through Watertown and Rochester to Buffalo. After crossing southern Ontario, the highway re-entered the U.S. in Detroit, running northwest and north via Saginaw and Alpena to the Upper Peninsula, where it turned west along the northern tier of the country. This portion took the route past Duluth, Minot, Havre, and Glacier National Park to Spokane. In order to reach Portland, Oregon, the highway turned south in Washington via Walla Walla to Pendleton, where it headed west again via the Columbia River Highway to Portland. The last piece of the highway to be completed was over Marias Pass through Glacier National Park; cars were carried through the park on the Great Northern Railway until 1930. The first inter-state numbering for the Roosevelt Highway was in New England, where the New England road marking system was established in 1922. Route 18 followed the auto trail from Portland northwest to Montpelier, where it continued to Burlington via Route 14. Many of the states along the route also assigned numbers to the highway; for instance, New York labeled their portion Route 3 in 1924. The Joint Board on Interstate Highways distributed its preliminary plan in 1925, in which a long section of the highway was labeled US 2, from St. Ignace, Michigan west to Bonners Ferry, Idaho. East of St. Ignace, instead of crossing to the Lower Peninsula like the Roosevelt Highway, the proposed Route 2 traveled north to the international border at Sault Ste. Marie. It reappeared at Rouses Point, New York, following Route 30 and then rejoining the auto trail between Burlington and Montpelier. US 2 and the Roosevelt Highway both connected Montpelier to St. Johnsbury, but the latter took a direct path along Route 18, while the former was assigned to Route 25 to Wells River, where it overlapped proposed US 5 north to St. Johnsbury. There, where the Roosevelt Highway turned southeast to Portland, Route 2 continued east along Route 15 to Bangor and Route 1 to Calais, then heading north on Route 24 to end in Houlton. By the time the U.S. Highway system was finalized in late 1926, one relatively minor change had been made to US 2; it was swapped with US 1 between Bangor and Houlton, Maine, placing US 2 along the entire portion of Route 15 east of St. Johnsbury. Several other major parts of the auto trail received numbers, most notably US 30 from Portland, Oregon east to Pendleton, US 195 in eastern Washington, and US 23 in Michigan's Lower Peninsula. In the mid-1930s, much of New York's portion of the road became US 104, and the part southeast of Littleton, New Hampshire to Portland, Maine became US 302, but by far the longest piece was that followed by US 2 between St. Ignace and Bonners Ferry. In 1946, US 2 was extended west of its original western terminus in Bonners Ferry in Idaho to Everett in Washington via Spokane along what was then Alternate US 10. US 2 was in the original 1925 U.S. Highway Plan by the Bureau of Public Roads and was first commissioned in Michigan in 1926. US 2 originally ran in Michigan from Ironwood to St. Ignace, the same termini as today. The highway has undergone many realignments, mostly minor, between those cities since 1926. In 1933, the section between St. Ignace and Sault Ste. Marie was relocated along Mackinac Trail. In 1957, the first segment of a new freeway opened between St. Ignace and Sault Ste. Marie. It ran from Evergreen Shores, north of St. Ignace, to present-day M-123 and replaced the former route on State St. and Mackinac Trail. Over the next six years, US 2 was moved from Mackinac Trail onto the new freeway as new sections opened. Beginning in 1961, the freeway was concurrently signed as an extension of I-75. The freeway was completed in 1963. The eastern terminus of US 2 in Michigan was truncated back to St. Ignace in 1983, removing it entirely from the I-75 freeway. Before being designated as US 2, most of the current alignment was called New England Interstate Route 15 from Danville, Vermont eastward to Maine. The portion of the old Route 15 that did not become part of US 2 was designated as Vermont Route 15. 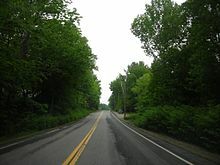 Other sections of US 2 in Vermont that were not part of New England Route 15 were parts of other former New England Interstate routes: Route 18 between Montpelier and Danville; Route 14 between Burlington and Montpelier; and Route 30 between Alburgh and Burlington. US 85 west-southwest of Williston. The highways travel concurrently to north of Williston. US 281 west-northwest of Churchs Ferry. The highways travel concurrently to west of Churchs Ferry. ^ Weingroff, Richard F. (January 9, 2009). "From Names to Numbers: The Origins of the U.S. Numbered Highway System". Federal Highway Administration. Retrieved April 21, 2009. ^ "Ask the Rambler: What Is The Longest Road in the United States?". Federal Highway Administration. December 29, 2008. Retrieved April 14, 2009. ^ "Geographical Center of North America". Rugby, ND: Rugby Area Chamber of Commerce. Retrieved June 6, 2010. ^ Minnesota State Legislature (2009). "§ 161.114, Constitutional Trunk Highways". Minnesota Statutes. Minnesota Office of the Revisor of Statutes. Retrieved June 6, 2010. ^ Minnesota State Legislature (2009). "§ 161.115, Additional Trunk Highways". Minnesota Statutes. Minnesota Office of the Revisor of Statutes. Retrieved June 6, 2010. ^ Sanderson, Dale (March 7, 2010). "End of US highway 2 (eastern segment)". Endpoints of US highways. Archived from the original on December 21, 2014. Retrieved June 6, 2010. ^ U.S. Geological Survey (September 12, 2016). "Rouses Point Bridge". Acme Mapper. Retrieved September 12, 2016. ^ Skidmore, Max J. (2006). Moose Crossing: Portland to Portland on the Theodore Roosevelt International Highway. Hamilton Books. ISBN 0-7618-3510-5. ^ Midget Map of the Transcontinental Trails of the United States (Map). Clason Map Company. 1923. Retrieved June 6, 2010. ^ a b Auto Road Atlas (Map). Rand McNally. 1926. ^ Hendrix, Mike; Hendrix, Joyce (July 17, 2007). "Marias Pass straddling the Continental Divide on US 2 in Montana". Retrieved June 6, 2010. ^ "New York's Main Highways Designated by Numbers". New York Times. December 21, 1924. p. XX9. ^ "United States Numbered Highways". American Highways. AASHO. April 1927. ^ a b c d Bessert, Christopher J. (January 31, 2009). "Highways 1 through 9". Michigan Highways. Retrieved June 6, 2010. Wikimedia Commons has media related to U.S. Route 2. This page was last edited on 14 April 2019, at 23:00 (UTC).